An after work sortie to No.6 tank without any great expectations and as it turn out I was spot on. A Little Egret flew from below the banks which flew over the far banks to settle on Lordship Marsh beyond. 100 Common Teal along with 12 Tufted Duck, 7 Shoveler and 67 Common Shelduck were settled on the flooded tank. Nearby 25 Raven were noted heading off to roost beyond Fox Hill. A pair of Marsh Harrier were noted and apart from a Kestrel and 2 Common Buzzard that was as good as it got. Nevermind, the main action kicks off next month so a south or south-westerly airstream will help bring in the rest of the summer migrants. Sparky and myself took advantage of the fine weather on our ramble up, over and through Delamere Forest today. Spring has truly sprung with the birds, Bees and Amphibians doing what needs to be done to set the seed for the next generation. It was no surprise to find ‘Amore’ in the air but it did impede the track ahead with Toads taking up prime positions as we were attempting to negotiate a footpath strewn with mating amphibians. The warm weather brought out a plethora of butterflies and most notable were Peacocks, Small Tortoiseshell, 5 Brimstone, 2 Comma and a single Orangetip. A pair of Mandarin were settled on a small pool at the metal road to Pale Heights. Two separate sightings of singing Blackcap, Chiffchaff were vocal throughout the forest as were Siskin and a small party of Crossbill flew over. My walk around No.4 & No.6 tanks this morning produced the following: Great Spotted Woodpecker along the fence at the Growhow Works and a female Sparrowhawk over head. Along the Holpool Gutter a herd of 15 swans made up of 10 Mute and the missing 5 Whooper Swans from Lordship Marsh, also in same field a flock of Black-tailed Godwit. Several Canada Goose, Tufted Duck and a pair of Gadwall were on the Manchester Ship Canal. At the Splashing Pool was a pair of Little Grebe and an impressive 18 Tufted Duck. Another Sparrowhawk (this time a male) spooked Common Teal and Shoveler on the small pool on No.6 tank. Nearby a male Merlin hunted low and fast over No.3 tank. Ewe and lamb wade and swim back to firmer ground during the tide on Frodsham Score. High tide beckoned on Frodsham Score and as always during fine weather heat haze can be a problem, but with the slow temperature rise and milky sunshine that was not to be a problem today. The 9.4 metre tide wasn’t enough to force the birds close to the ship canal but plenty of stuff was moving around and some was already viewable on arrival. Above a Barnacle Goose with Canada’s on Frodsham Score today. 11 Whooper Swan were distant on the Score, presumably these and the 54 Pink-footed Goose and a Barnacle Goose were birds stopping off en route north. 134 Wigeon, 6 Gadwall and 44 Common Teal rode the tide in and rode it out. Shorebirds noted included 600 Curlew, 67 Oystercatcher, 34 Ringed Plover, 23 Grey Plover, a Whimbrel was heard as it move through, 120 Dunlin and 45 Redshank. Also present and flushed from the tidal gutter were 2 Little Egret. Ever watchful a big female Peregrine was strategically positioned on a fence post in the middle of the Score. While a ‘ringtail’ Hen Harrier was hunting the reed beds of No.6 tank and both male and female Marsh Harrier were present. A rich supply of carrion attracted the big hitters to the Score with 30 Raven and an equal amount of Great Black-backed Gull enjoying the mutton dinner. I couldn’t avert my scope when a GBBG found a recently dead Ovis aries and proceeded to enjoy an Eastern delicacy of sheep’s eye! Two Sand Martin over the Canal Pools and 2 Swallow over No.1 tank brought the warmth of summer with them. Displaying Meadow Pipit and tuneful Skylark filled the air with song. A flock of 200 Goldfinch were fairly mobile. Observers: Frank Duff, Arthur Harrison, WSM (and images). A walk along the Weaver causeway to the bend wasn’t really that productive but a single Goldeneye and 54 Tufted Duck perhaps made the effort worthwhile. Noisy Oystercatchers and 10 Gadwall were additions to the watch. A drive up to Marsh Farm saw a good scattering of Curlew in the fields of No.1 tank. Also present a couple of white domestic goose with the usual Greylags there. A fine male Wheatear was looking lonely perched on a wood pile close to the cattle grid at the farm. Finally a brief watch over No.6 tank was rewarded by a male Merlin, 10 Raven, 100 Common Shelduck, 24 Common Teal and 20 Cormorant. A Marsh Harrier was again hunting the reed beds on the marsh. No.6 tank today featured 34 Common Teal and 98 Common Shelduck. 4 Shoveler were on the small pool of No.6 tank and also present there were, 1 Common Snipe and 3 Coot. Upwards of 128 Canada Goose were on the fields of No.3 tank and 42 Curlew at the far end towards No.4 tank. The Splashing pool by No.4 tank usually is limited by the amount of water to attract and hold any large numbers of ducks so several Mallard and 4 Tufted Duck were about a typical count. The Great White Egret was again on Lordship Marsh this morning (SH) by the blue slurry tank. A male Marsh Harrier was hunting the Weaver Bend in the early evening (AH). Ducks were again a feature on No.6 tank and Common Teal were numbering 94 birds. 8 Shoveler, 6 Tufted Duck, 6 Gadwall, 12 Mallard and 56 Common Shelduck made up the rest. 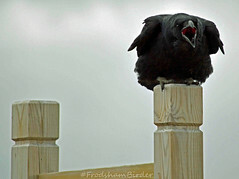 Raven numbers are building up with 30 birds present on both No.5 tank and Frodsham Score. A Water Rail was calling from the reed beds on No.6 tank. The Great White Egret was hunched up looking forlorn in continuous rain above a ditch between the motorway and the model aircraft flying field at 10.20 this morning. Looks like the Whooper Swans have not been seen since last week.